Bento is reinventing how businesses manage B2B payments in the digital world. Bentos financial operating platform enables businesses to issue physical and virtual payment credentials to people and systems without introducing risk while providing companies unprecedented control and visibility over their B2B expenses and company spend. Open APIs, and White Label partnerships extend these control and management benefits to automate payments well beyond expenses alone. We are a small construction company who specializes in maintenance of apartment buildings. Our crew used to buy materials everyday for jobs and come into office for re-reimbursement checks every couple days. Now they are not loosing time in the field and book keeper isn't having to stop in the middle of something to review receipts and cut a check. We have also seen saving in 'returns'.. with crew using cards refunds are issued to the cards, not given in cash. The tagging feature allows job cost tracking at a quick glimpse as well. Controlling spend limits etc is great and if needing adjusting (i.e. a larger purchase) can be done in seconds and the crew in the field then immediately can use card with the change. I would like to see a quicker fund load when doing a bank transfer and a larger transfer limit, but otherwise no complaints!Time and money saving, great control of spending from anywhere, snap shot of job costs thanks to 'tag' feature. Time and money saving, great control of spending from anywhere, snap shot of job costs thanks to 'tag' feature. Would like a quicker transfer time or loads from bank and a larger limit per day in transfers. As an administrator, I am able to assist our local or traveling employees at the office on my desktop, or at home from the app. Easy to make any adjustment (in real-time, no delay) to any users daily/weekly/monthly allowance and spending category, or turn off the card if lost, stolen, or for misuse. Reports are easily downloaded for monthly reconciliation. Ease of use at office or home. Immediate access and ability to adjust a users funds, categories, or turn the card off. Report is simple to download for monthly reconciliation process. Users can see their limits quickly via app. Ease of use at office or home. Immediate access and ability to adjust a users funds, categories, or turn the card off. Report is simple to download for monthly reconciliation process. Users can see their limits quickly via app. Bento cards have simplified our business spending immensely We can now offer company credit cards to our employees as one of their benefits All cards are immediately controllable and suspendible if lost or stolen or upon termination Spending limits allow for control of funds and restriction of categories The customer service can't be beat! They will work until it is solved and never leave you hanging! The only negatives would be to have an integration with QuickBooks, which is in the works, and international purchasing ability-also in the works!Functionality and ease of use Customer Service-Senam is outstanding! Functionality and ease of use Customer Service-Senam is outstanding! I have no complaints at all about anything on the Bento software. The easiest part of my job by far. One thing I would suggest improving is to allow us to use our own categories that can match our accounting software or link it to our Quickbooks. I was not able to do this last year (2016) and have not looked to see if I am able to do this now - maybe a newsletter if this issue has been fixed? Cards can be set up for different purposes, such as fuel/gas, individual employees, specific projects, office expenses, petty cash, and more. Fuel cards set up through Bento can be used at any gas station, rather than being limited to ‘in-network’ gas stations, and additional spend categories can be enabled or disabled by the business owner as required, including car rentals, vehicle repairs, and meals. 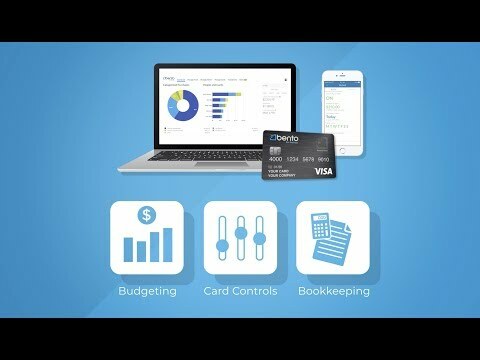 Expenses are displayed visually on the dashboard in real time, organized by card/person and spend category, with adjustable date ranges and the ability to drill down into transaction details. A full list of transactions can be viewed, and users can filter the transactions shown by date, type, card, tag, or category, or search for specific transactions. Users can select spend categories for each card to control where transactions can be made, with options including amusement & entertainment, business services, gas stations, professional services, restaurants, repair services, travel & transportation, and more. Two alert types are generated automatically, for declined transactions, and for low balances, with users able to select which alerts they wish to receive. Below are some frequently asked questions for Bento for Business. Q. What type of pricing plans does Bento for Business offer? Q. Who are the typical users of Bento for Business? Q. What languages does Bento for Business support? Q. Does Bento for Business support mobile devices? Q. Does Bento for Business offer an API? No, Bento for Business does not have an API available. Q. What other apps does Bento for Business integrate with? Q. What level of support does Bento for Business offer?